But aren't low wages "necessary" to bring you, the consumer, the lowest prices? If this is so, then why can Costco pay living wages and benefits and still turn a profit? Could it be that mere greed drives Wal-Mart's pathetic wage and benefit structure rather than business necessity? Urban planning and zoning codes encourage Wal-Mart et. al. to pave over farmland on the edge of town with enormous parking lots, leaving the costs of repairing and improving the aging, largely abandoned town centers to the local taxpayers. Judging by what has been built to date, it would seem impossible for Wal-Mart et. al. to occupy a small-town Main Street; yet examples abound (for instance, Pasadena, CA) in which a major retailer anchors a refurbished town center, bringing enough business back to the central retail district to support small retailers, restaurants, and all the other constituents of a lively, vibrant town center. But such far-sighted, community-oriented development requires political will, practical urban planning and some funding. Ironically, redevelopment funds are often available to such renovations of town centers; such direct government subsidies are at least visible and open to public opinion. The invisible subsidies supporting big-box sprawl are not. The cost of a product being manufactured and retailed is not on the price tag--it's the true cost of the product's entire life cycle from raw materials to disposal or recycling of the defunct product. So who pays the true cost, which is far higher than the price tag? Taxpayers. Consider the absolute tonnage of poorly made junk which moves rather quickly from the shelves of Wal-Mart, Ikea, Target, etc. to the local landfill. Who pays for the enlarged landfills, or for dealing with the toxic waste in all the consumer electronics which are tossed every year? The taxpayer, and all the other nations to which we transport our environmental wastes. There is another way--build products which are made to last and require the consumer to pay for their recycling costs in the purchase price. While the retailing giants like to crow about how much money they donate to local charities, the reality is much less than their PR hype. I know about this because my niece is a fundraiser for a small town PBS-TV affiliate. While she has been successful in securing donations from the local outposts of global or national chains, such donations are small because the funds available to the local managers are limited; serious money has to be approved by "corporate," which is slanted toward the big, PR-safe organizations like the Red Cross. While donating to the corporate national charities is worthy, such pittances (compare their cash donations with their earnings if you have the heart) do not replace the volunteer time, goods and cash donated on a year-round basis by the small business community. A million bucks given to the national Red Cross does not replace $10 million of local business support for local organizations serving local populations. A community strip-mined of local businesses by the big chains has only one source of revenue to turn to--the taxpayer. 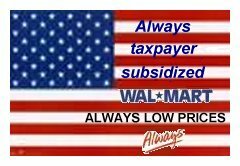 "Always low prices" aren't low; they're simply subsidized.